Earlier this week, I was on a brisk walk from my workplace to my doctor’s office. I was running about 10 minutes late (and since no taxi cab available for at least another 15 minutes, I had to walk), I was my doc’s last appointment for the day, and on the way, I was being stopped by some guy who made a quick comment about my yellow rain hat (it was raining and blowing, and as someone from Denmark, he seemed to want to know what it was called in Norwegian). He kept on talking, I was stressed out, and he casually mentioned that he was a monk (he didn’t look like it, but then again, it was cold), and was spreading the word of true yoga. I really didn’t have the time, so I had to cut him short if I wasn’t going to be too late for my appointment. The next day, I ran into him again, at the same location, and I was waiting for the bus onwards to work (it was another bad weather day, but at least it wasn’t raining). He started talking again, showed the book he was handing out, and again, finally asked for a donation of some coins (just so he could cover his travels). As the bus was arriving, and about to leave, I had to cut his speech short, but not before he handed me his book and kept badgering me for some money. I only had some small coins in my wallet, so I handed it off to him. Frankly, I was annoyed at him, I was the last passenger coming onto the bus, and this monk guy was holding me back. 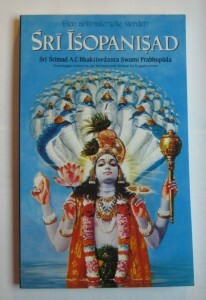 Later in the day, after coming home, I tried finding out what the hell this thing was, and reading the inside cover (where the title, copyright and ISBN is listed), I found a reference to the Hare Krishna movement (by its offical name, ISKCON). I mean, if you found your religion, I’m fine with it, but please don’t go around pushing your agenda on random strangers like that. Most people find it annoying. I’ll keep the book, though. It’s likely to collect dust at the back of my shelf, I might pull it out some time, just to get a more thorough understanding of that religion (which would be around the same time I get my own Bible and Koran for my bookshelf). I’m not taking the trouble to walk around with it, trying to find the guy again so I can return it, it’s just not worth the extra effort. 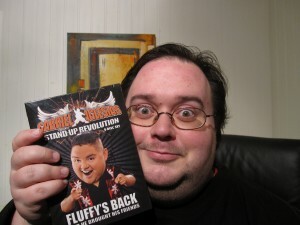 On the brighter side of this week, I just got the “Stand-Up Revolution” DVD (with Gabriel Iglesias, aka. “Fluffy”, and his friends) I ordered from Amazon.com two weeks ago. It has 2 DVDs in it, has the complete 8 episodes of the show from Comedy Central, and has Fluffy himself, plus 18 of his stand-up comedy friends (according to the cover). While I’m writing this, I’m about half-way through the whole thing, and I’m enjoying every second of it! If you ever come across Fluffy’s stuff, I can recommend it 100%. I’m just sorry I missed out while he was in Norway last month (it was in Bergen, and I found out about it only a few days before the show). I hope I’ll be able to meet him in person some day, though. In other news, Christmas time is off to a start, and present shopping is officially well into it’s second lap. I already have two presents down, and several others to go. I’ll get back with an update later, I guess. While on my lunch break today, I had a very interesting experience. I was approached by young, deeply Christian people, twice. Let me share the moments for a bit. The first encounter was outside a grocery store (where I had just made some minor purchases). I was sitting down on a bench, enjoying the last few sips of some strawberry milk (no, I’m not making that up), when a Swedish girl asked to sit down with me to talk a little (she did bring a friend, but she kept very much in the background). She revealed that she was a Christian, with a deep faith in Jesus (you know, that guy from the second half of the Bible). She wanted me to know that God sees me, and will continue to protect me (no matter what I believed), and asked further what my faith was (agnostic – I’ll explain further down – as I also explained to her). My faith is very inclusive towards all/most religions, basically. She also asked if everything was alright, if I had any problems in particular, which I really don’t. We had some small talk for a few minutes before we said our goodbyes. The whole thing kinda put me off for a few minutes after that, but all in all, it was a slightly positive experience. Later on, about 15-20 minutes after my first encounter, and on my way back to the office, I had a second encounter. This time, it was one guy (Norwegian, who sounded like he was from the Oslo area) and two girls (who the guy identified as being Canadian and American). I had noticed their faces a few minutes earlier, as I had just passed them about a block earlier, heading in the opposite direction, but they must’ve taken an interest and caught up with me inside a shopping mall. They, too, were Christian, and they asked if they could pray for me. Heck, I’m an open-minded guy, and thought that if it would make them happy, I’d just let them. They, too, asked if there were some problems in particular to pray for, which I really didn’t. They each put one hand on me and took a turn with their prayers, basically asking to protect me and praying for my continued kindness, each in their own words. The whole séance probably took about 5 minutes, with odd stares from people passing by. When they finished, they thanked me for the opportunity, and we said our goodbyes and went our separate ways, leaving me with a strangely positive feeling of some strangers caring about me enough to do all that. Yep, today, I was a Christian magnet! It was a particular “life is good” kinda day, too. My monthly pay rolled in the day before, and my 31st birthday is tomorrow (well, technically speaking “today” at the time I write this – it’s way too late in the evening/night, though). Some of you might wonder about my stance towards faith and religion. I define myself as an agnostic, which means I’m in doubt. I believe there’s something all around us, which is yet to be properly defined. I believe that religions world-wide have made efforts to define it by giving it names. Some call this feeling God, some call it Yahweh, some call it Allah, some call it The Force, some call it Mother Nature, some have even split it into several deities. In essence, I believe all of these are one and the same, only with different names. I believe there is “one truth” for all of us, yet to be defined, and that this truth is somewhere in our common future, somewhat further down the line that any of us can see. In the meantime, it is not only correct, but essential to keep your current faith, as long as you respect the faith of others, even if it seems to differ from your own. The important thing is not what you believe in, but that you practice your belief respectfully and without resorting to violence. OK, that’s probably enough words of wisdom for one day. I guess the idea of growing older is sneaking up on me today. Posted in blog, religion | Comments Off on Bless you! 2004-2019 © NeonNero. Do not copy or produce derivative works without express permission. This work is licensed under Creative Commons License. Cartoon strips are reproduced without permission whatsoever. Other article illustration photos are © NeonNero unless otherwise noted.